When connecting RGB(W) strip you connect a positive connection (Red) and a negative connection for each color. 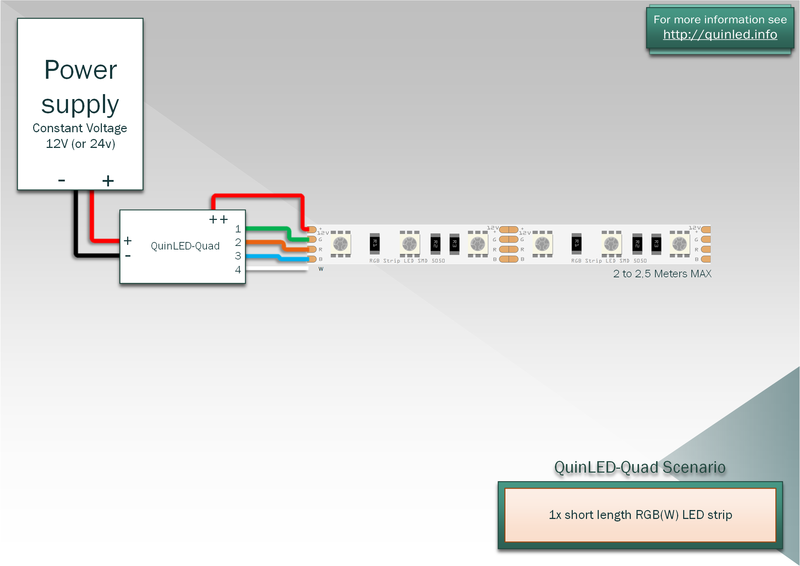 QuinLED-Quad has up to 4 channels so when connecting up RGBW strip it uses all 4 channels (white is just another channel next to red, green and blue). Although hooking up a 5m strip directly to the QuinLED is technically no problem, in most cheap 12v strips the voltage drop becomes so high that a very visible fade off shows at the end of the strip. Most often this effect is not desired. This is what these advanced diagrams are for. If you are not bothered by this, are using a high quality LED strip or want to try only feeding the strip from one side, there are no dangers in doing so. 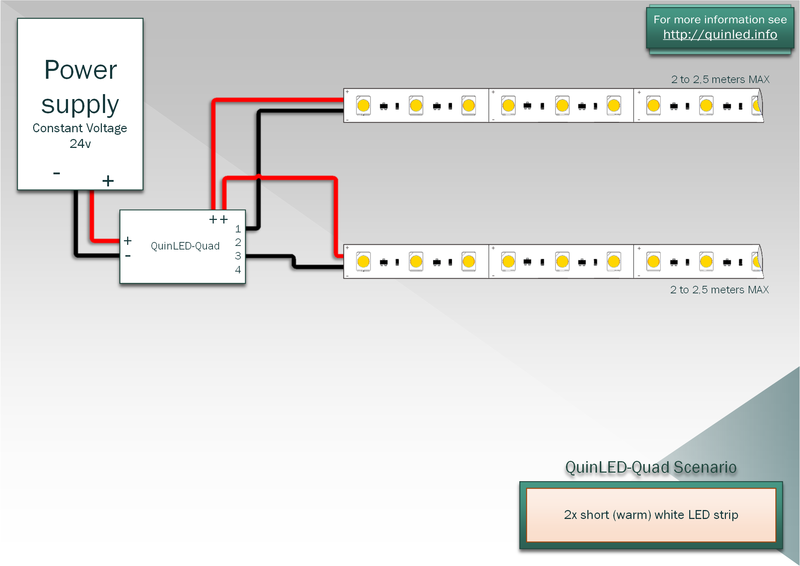 These diagrams show you the smartest way to solve this issue while still using a single controller to hook up longer/more LED strip. 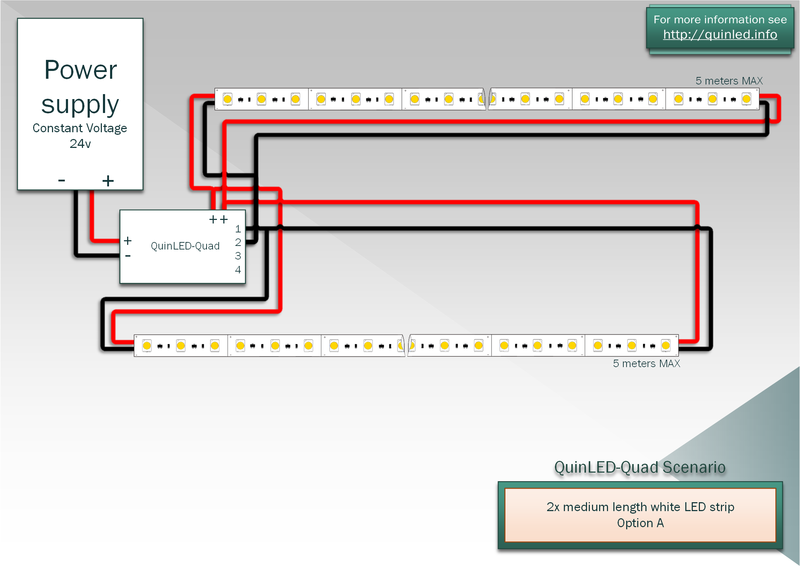 Most of my LED strips I only single feed, but often they are not longer then the 2,5m specified in the diagrams. All of this looks complex in the drawings but mostly isn’t in reality! For more complex situations, consider using multiple shorter segments instead of 1 large segment. Because everything is linked through Domotica, sending a command to 1 long strip or the same strip split into 4 parts takes just as much effort! Not enough + (Red) terminals! For some configurations you have too many wires (or to big) to fit into the two available + (Red) terminals. You can fix this by using an external connector block. You can make two (thick) short wires, connect this into the connector block and then connect the 4 + (Red) wires of the LED strips into the same connector block. All + (Red) planes are shared so can be connected together in this way, do NOT do the same with negative (Black) connections! You can find these blocks in the Tools and Equipment article. The 5 pin variant works well for this. 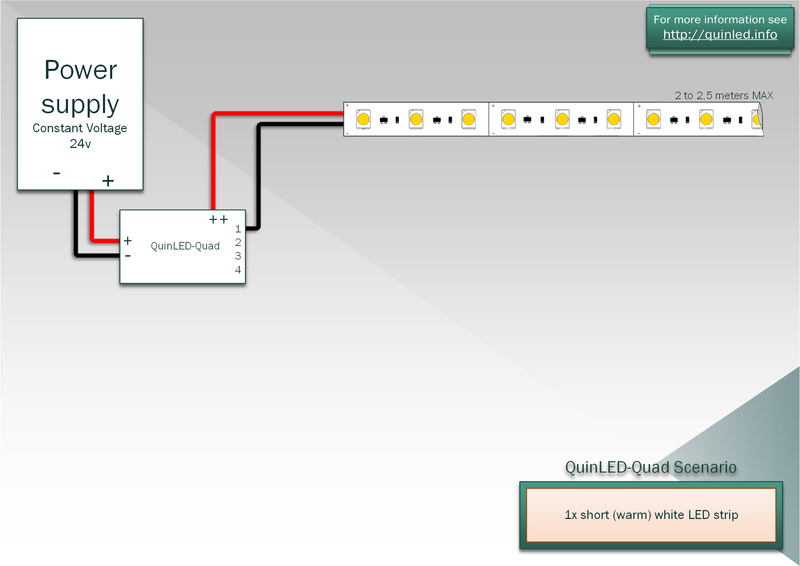 For very long LED strip sometimes you will need to connect 2 or more – (Black) wires into the same terminal. For these cases you can again use a connector block (per output!) 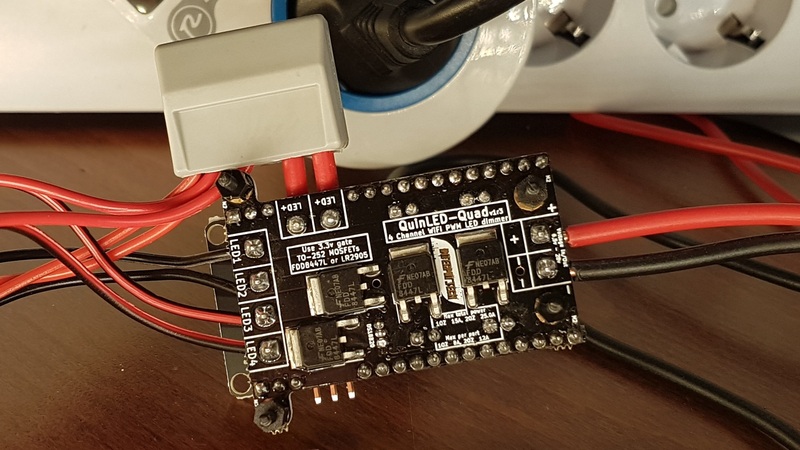 but you should also consider splitting the strips in multiple segments, at some point you are going to overload a single channel in regards to power output while the board could handle more if the load is split over multiple channels. *When double feeding an LED strip you can halve the amount of current each cable needs to transport and thus use thinner wires then when middle feeding the cable! Please see this article to learn more about the thickness of the cable you need! Hooking up a 5m RGBW strip basically works the same way as hooking up a white LED strip, there is just an extra wire per color to think of. Again you have the choice to either double feed them from each end or to do some soldering and middle feed them. Below diagram is for middle feeding the strip since it uses the least amount of wires. If you want to connect even longer strip then 10m you need to create more feed in points and this will take some careful planning. But as stated above, try and and rethink your desired situation and maybe use several smaller length segments instead of a single long one! Also keep in mind the maximum amperage rating per port vs of the total board, using very long length LED strip you will exceed the rated per port currents anyway and you will need to split the desired length over over multiple output ports and thus multiple segments.